You are here: American University Media Relations News American University Launches Innovative Carbon Offset Program in Washington, D.C.
American University has announced an innovative program that will offset the carbon emissions caused by students, faculty and staff members who commute to campus by planting and nurturing 650 trees throughout the nation’s capital. The initiative will also provide AU students with access to the urban forestry data from this program to inform their own field studies in urban planning and other related fields. As a charter member of the Second Nature Climate Commitment, AU is committed to achieving carbon neutrality by 2020. In addition to cutting emissions by promoting energy efficiency and adopting renewable energy projects on and off campus, the University also purchases carbon credits to offset the effects of commuting across the D.C. region. Carbon credits often are generated by tree-planting or emission-reduction projects in remote locations. While helping to reduce global greenhouse-gas levels, these distant projects typically offer no tangible benefits to the local community. 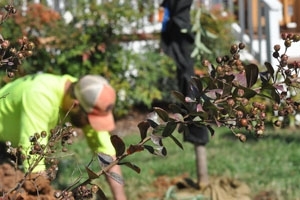 Through the new program, facilitated by Urban Offsets, a North Carolina-based urban forest development company, a portion of AU’s carbon offsetting funds will be used to augment the District of Columbia Department of Energy and Environment (DOEE) and Casey Trees’ ongoing tree planting and maintenance efforts, specifically the RiverSmart Homes and Large Parcel Tree Planting initiatives.